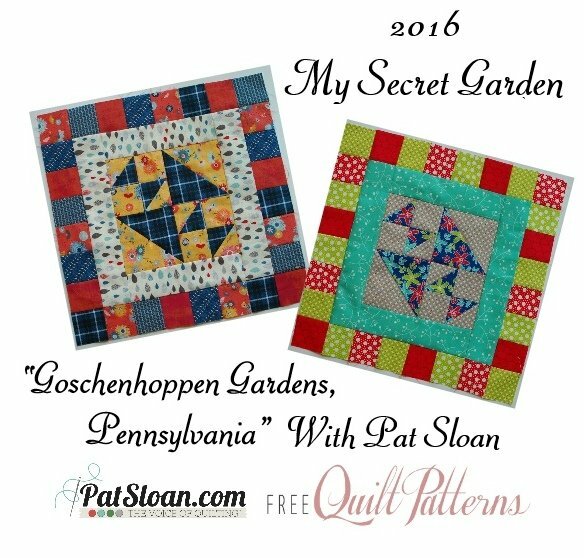 Welcome to the third year of our exclusive Free Mystery Block of the Month by Pat Sloan! This year Pat's theme is 'The Secret Garden'. With travels back in time in Goschenhoppen, Pennsylvania! The past blocks and supply list are here. Watch the Video as Pat gives explains the block 10 and talks about the setting. I love doing the blocks in two colorways so you can see how different fabric placements change up a block. Each time I do a new block in 2 colorways I see fabric in a whole new way! NOTE – This is the end of the patterns & setting and I’m SO excited to see your final quilts, tops are good! There is extra fabric if you bought per my supply list. I gave you extra because during a year long project fabric is gone, and at the end so many people write me and say they wish they had extra to make co-ordinated projects. You have enough to make matching pillows with blocks or just fabric, maybe a table runner. Or if you are giving, you can create a custom pillow case! In November we’ll post again so you can see my two quilt tops all finished, and I’ll host a GIVEAWAY to someone that has completed the top. In late Nov/Early Dec we’ll announce the 2017 Mystery! I asked my Facebook group for recommendations of interesting gardens, and Pat G. shared the Goschenhoppen Gardens. 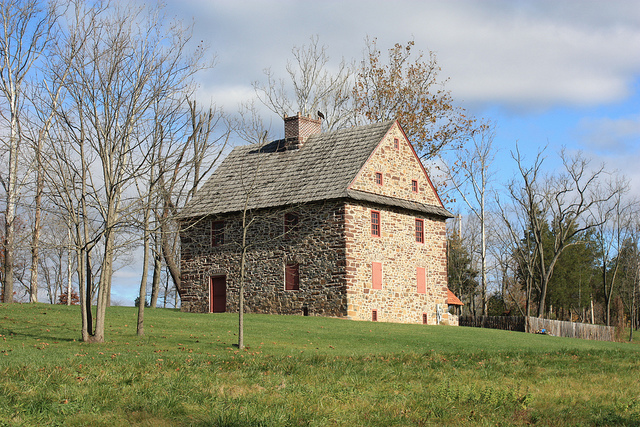 This is the Henry Antes House from 1736. Pictured behind it the 18th century garden. 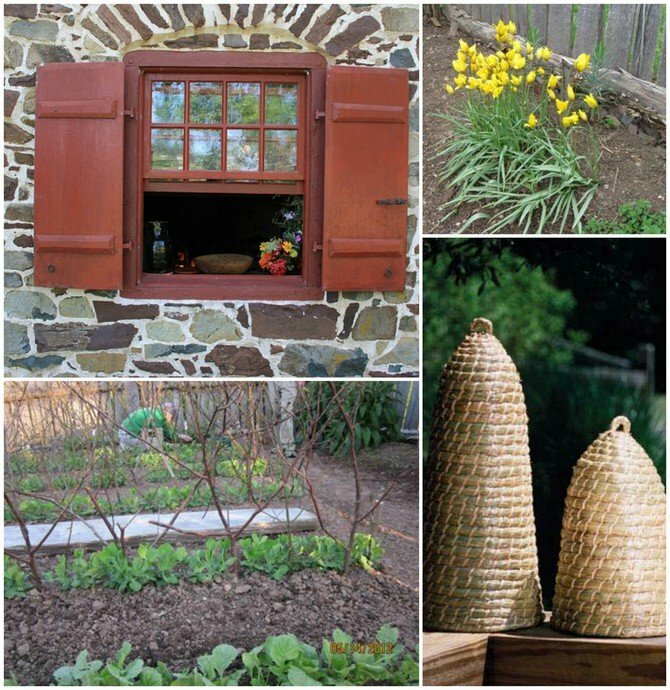 I love the simplicity of this old colonial garden. Living in the North east for many years of my life, the colonial history is always intriguing to me. I’ve been fascinated with gardens since high school. One of the first things I planted were tomatoes in my parents back yard. I’m not sure what my mom thought of that! Years later when I had my own home I discovered Country living magazine, with lots of charm and a nod back to colonial roots. I grew dill, basil, green beans, and peppers of all kinds. Later I shifted to just flowers, but I’m still forever fascinated with colonial gardens. You’ll sometimes see images like those Beeskeps, in my quilts. I hope you enjoy learning about this and schedule a visit!